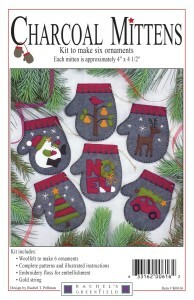 Rachel’s of Greenfield has three ornament kits in the top 100 patterns this week! 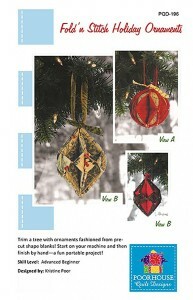 The kits include everything you need to make six ornaments – right down to the gold hanging thread. They are perfectly sized to fit in a gift card so they can stand alone and BE the gift or be used as the embellishment on the gift! Wouldn’t these be fun to have at a holiday get together? They could make an ornament to take home with them as a memory of the party. They are all in stock so you can get them in time for this holiday season! 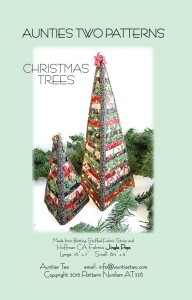 I can tell that the Christmas fabrics have arrived by the number of Christmas patterns that are in the top 100! Here they are – order them now and get your samples ready. Christmas is less than four months away…. 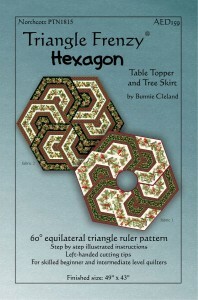 Many of you have paid your rent with the Triangle Frenzy table topper patterns. Now Bunnie has given you a choice – you can put it under the tree with stunning results. This pattern features the Creative Grids® 60 degree ruler in the larger size – CGR12560. Aunties Two Christmas Trees can be embellished with Fairy Lights – and yes, we have those listed as companions to the pattern! 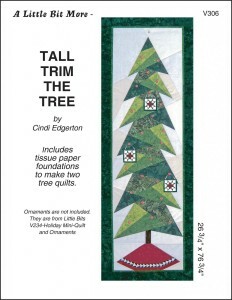 Or paper-piece your tree with these patterns by Cindi Edgerton. 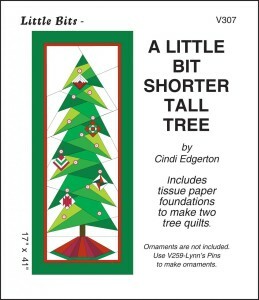 I want to make the smaller version for my grandchildren’s bedroom doors so they can decorate their own trees! 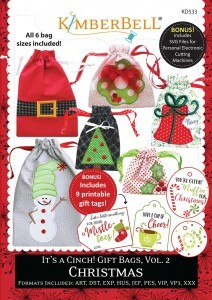 Ornaments are always popular and make great package tags for those special friends. Charcoal Mittens includes everything you need for these six styles. Or use the pre-cut square and round Bosal coasters to make these Fold and Stitch ornaments. These bag patterns from Kimberbell can be used year after year and are a great way to use up those Christmas fabric scraps! Go Green! Now is the time to offer classes while your customers still have time to make them! Houston – Thanks for the memories….